6 Units of Yacht&Smith Ruffle Slouch Socks for Women, Unique Frilly Cuff Fashion Trendy Ankle Socks (6 Pairs Assorted Colors) - Womens Ankle Sock at low wholesale prices. 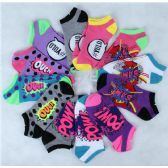 alltimetrading.com offers Womens Ankle Sock at bulk discounted prices. Get 5 pairs of super fashionable slouch socks with a frilly cuff. These fashion ankle socks are perfect for wearing for most occasions. Whether it’s a party, evening event, a costume, these socks will spice up your outfit. Unique and separates itself from typical socks with a trendy new look.